Is Trump driving Putin and Merkel together? In an interview with *Background Briefing with Ian Masters* on KPFK-FM 90.7, Los Angeles, on Monday, Sept 12, I comment on Angela Merkel’s phone call to Putin regarding the conflict about North Korea’s nuclear armament, Merkel’s offer to become involved in a diplomatic initiative to end the North Korean nuclear and missiles program, the German Russian relations in general, and the Russia’s possible interference into the upcoming German elections. Please note, that I have recently moved to a new office. I am now at 201 White Hall and not at 216 White Hall anymore. Office hours (still Tuesday 3-5:00 PM) will now also take place at my new office. And please do not forget to email me in advance and let me know that you are planning to come, as otherwise I might not be there. Thank you! In an interview with *Background Briefing with Ian Masters* on KPFK-FM 90.7, Los Angeles, on Sunday, May 07, I comment on the influence of the hacking attack on the French presidential election, the reactions in Germany following the victory of Emmanuel Macron and the upcoming Bundestag elections in Germany, in particular the possibility of Russian interferences in the campaign for the German General Election. In an article on the influence of the hacking attack on the French presidential election, which got published in the Los Angeles Times on May 06, 2017, I underline the importance of the June legislative elections for Emmanuel Macron’s ability to govern France effectively and realize his ambitious economic reform plans. Yesterday a round-table of the Cornell Institute for European Studies (CIES), including Christopher Way (Government, Cornell), Robin Best (SUNY Binghamton), Mabel Berezin (Sociology, Cornell) and me (Government, Cornell) discussed the first round of the French Presidential Elections. See article in the Cornell Daily Sun here. Krewel, Mona (2017): Modernisierung deutscher Wahlkämpfe? Kampagnenkommunikation zwischen 1957 und 1965? [Modernization of German Election Campaigns? Campaign Communication between 1957 and 1965]. Baden-Baden: Nomos. 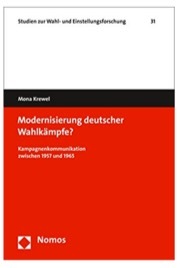 The central aim of the book consists in the description and explanation of the developments within the campaigns of the CDU and the SPD for the German federal elections of 1957, 1961 and 1965. Thereby particular attention is paid to potential differences in terms of timing with regard to the development of campaigning between the CDU and the SPD. Moreover, the book thematizes the underlying causes of these differences. 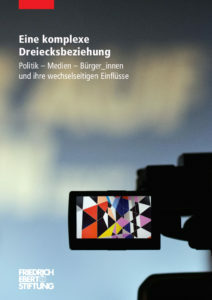 Beyond that, the book gives an answer to the question, whether the encountered developments in campaigning can be considered as a modernization of campaigning and if the election campaigns between the end of the 50s and the Mid-60s therefore can be characterized as the beginning of the age of modern campaigning. Faas, Thorsten und Mona Krewel (2016): Eine komplexe Dreiecksbeziehung. Politik – Medien – Bürger_innen und ihre wechselseitigen Einflüsse. [A complex triangle relationship: Politics – Media –Citizens and their reciprocal influences.] Bonn: Friedrich-Ebert-Stiftung.